What Day Of The Week Was August 24, 1991? 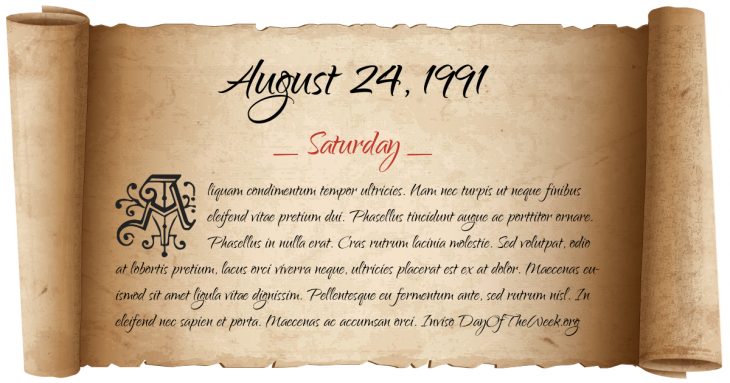 August 24, 1991 was the 236th day of the year 1991 in the Gregorian calendar. There were 129 days remaining until the end of the year. The day of the week was Saturday. A person born on this day will be 27 years old today. If that same person saved a Half dollar every day starting at age 3, then by now that person has accumulated $4,504.50 today. Mikhail Gorbachev resigns as head of the Communist Party of the Soviet Union. Ukraine declares itself independent from the Soviet Union.